Migration watch; 07.10 - 11.10hrs. A WHITE STORK of unknown origin flew west over Hackness at 13.00hrs. On the move (south unless stated) were 1 Cormorant, 1 Little Egret, 1 Red Kite at 08.53hrs, 2 Oystercatcher north, 1 Black-headed Gull, 1 Common Gull + 3 north, 7 Swift, 8 Sand Martin, 38 Swallow + 9 north, 10 House Martin + 2 north, 2 Meadow Pipit, 4 Flava, 3 Jackdaw, 10 Carrion Crow + 2 north, 3 Goldfinch and 14 Linnet. A singing Firecrest was a nice find at Ravenscar, Wykeham South Lake produced small numbers of waders moving through during the day including 2 Sanderling, 8 Dunlin, 2 Ringed Plover and 8 Whimbrel. Also there were 4 Little Ringed Plover, 3 Common Sandpiper, 20 Swift, 2 Yellow Wagtail, 1 Wheatear, 1 Gadwall, 1 Peregrine, 2 Pink-footed Geese and 4 Egyptian Geese. At Seamer Tip there were 12 Whimbrel, a male Redstart was the highlight of various breeding summer migrants at May Beck , 4 Purple Sandpiper were in Cornelian Bay and a Wheatear arrived in off the sea along Marine Drive. 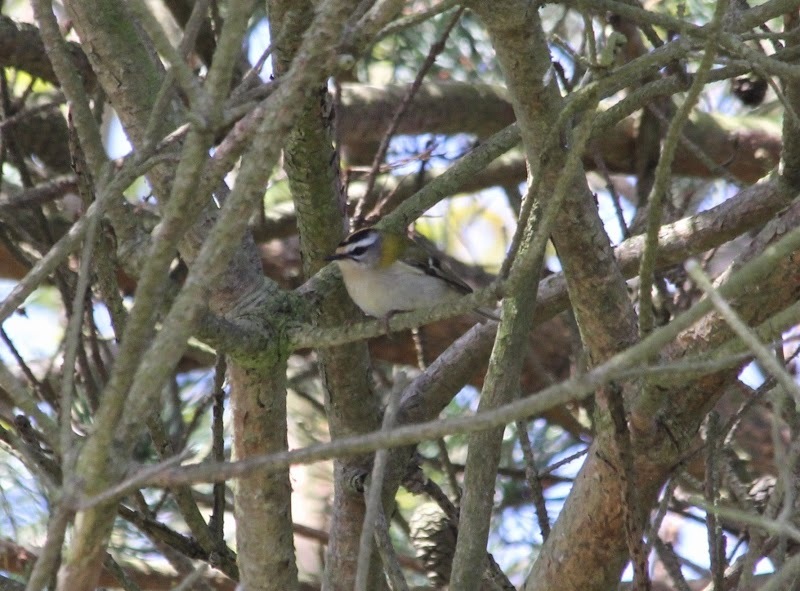 Firecrest - Ravenscar - Michael McNaghten.